What is a courtesy crossing? What is a courtesy crossing? What is a courtesy crossing? Courtesy crossings are usually made of bricks or paving and are often raised above the level of the road. They are not official pedestrian crossings, but they do provide a place where drivers can stop safely to allow pedestrians to cross. A courtesy crossing is a raised crossing in the road that you aren't required to stop for, but allows for a safer place to stop if pedestrians do want to cross. The courtesy crossing can subtly direct pedestrians to attempt to cross in a specific place. 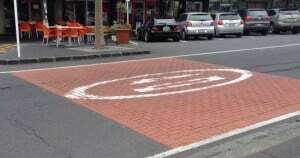 In this example in Three Lamps, Ponsonby, Auckland, the courtesy crossing sits on a section of one-way street. There's a pedestrian crossing around 50m to the right, and a controlled crossing at the traffic lights around 50m to the left. However, because this area is used by a lot of pedestrians going to the cafes, they tend to want to cross the road where it's most convenient. You can see the path is extended towards the crossing rather than accommodating more parking. Pedestrians are almost funneled into this courtesy crossing area rather than randomly crossing anywhere. The change in the road surface and colour makes drivers aware that this is a place that pedestrians might use to cross. They aren't obliged to stop for pedestrians, but when vehicles have to stop for the actual pedestrian crossing slightly further up the road, they tend to leave a specific gap across the courtesy crossing for pedestrians to cross. Vehicles are also reminded on the prominently coloured crossing that the speed limit is 40kph. This isn't an automatic speed limit at a courtesy crossing, just one that's specifically imposed on Ponsonby Road. Courtesy crossings might be marked in places where the limit is up to 50kph. Other courtesy crossings are not so prominent, using grey bricks, paving slabs or tiles. Click here to view our extended guide to pedestrian crossings.